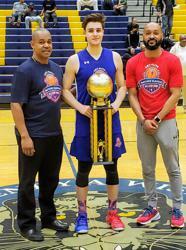 Nation's Classic MVP Gibson Jimerson with DMVelite CEO Chris Lawson and Event Director Brian Inge. UPPER MARLBORO, MD - The inaugural DMVelite Nations Classic All-Star Event brought together a host of talented players last week, culminating with three games on Saturday at Wise High School. The lead up to Saturday’s finale included several seminars, as well as a trip to the National Museum of African-American History & Culture. The week closed with Saturday night’s Nations Classic Game, which saw Team Stripes down Team Stars, 145-100. Montverde Academy (FL) guard Gibson Jimerson had 30 points on 11-of-16 shooting - including 7-of-11 from 3-point range to earn game Most Valuable Player honors. Maryland-bound Donta Scott of Imhotep Charter (Pa.) had 26 points on 10-of-14 shooting, 8 rebounds and 6 assists, and Miami-bound Monsignor Bonnor (Pa.) guard Isaiah Wong had 24 points and 12 boards. Georgetown-bound Flint Hill (Va.) center Qudus Wahab had 21 points, Villanova-bound Abingdon (Pa.) forward Eric Dixon 13, Syracuse-bound Wesstown (Pa.) forward John Bol Ajak 12 and Montverde guard James Lee had 11. Maryland-bound Wilson forward Makhi Mitchell had 18 points to lead Team Stars, while his Boston College-bound Wilson teammate Jay Heath had 17. Virginia-bound St. John's guard Casey Morsell had 13, while Pitt-bound Scotland Campus (Pa.) forward Karim Coulibaly, Miami-bound Brewster Academy (NH) forward Anthony Walker and Patterson guard Marvin Price had 11 apiece. Coppin State-bound Eleanor Roosevelt guard Isaiah Gross poured in a game-high 40 points t earn game MVP honors as the 295 All-Stars pulled away to edge their 495 counterparts. Gross went 16-of-23 from the field and 7-of-12 from 3-point range. Boston College-bound St. Andrew’s wing Kamari Williams had 27 points for the 295 squad, which also for 20 points and 10 rebounds from Towson-bound St. Stephen’s & St. Agnes forward Charles Thompson, 18 from Longwood commit Heru Bligen (St. Andrews) and 17 from Eleanor Roosevelt guard Cameron Brown. Bishop McNamara guard Jon McGriff had 35 points on 14-of-21 shooting to lead the 495 All-Stars. Marshall forward Daniel Deaver posted 18 points, Yale-bound Maret forward EJ Jarvis 18, Air Force Academy commit Christian Depollar (St. Stephen’s & St. Agnes) 12, Towson-bound Sidwell Friends guard Jason Gibson 11 and Wise guard Fred Crowell 10. Episcopal (Va.) 2020 wing Tymu Chenery had 27 points, 7 rebounds and 6 assists to earn MVP honors for Team Up Next in the the day’s opening game, which showcased some of the area’s top underclass talent. Landon (Md.) 2021 guard Kino Lilly poured in a game-high 28 points on 11-of-15 shooting and had 8 assists for Level Up, while Rock Creek Christian (Md.) 2021 forward Zaakir Williamson had 20 points and 10 rebounds and St. Stephens & St. Agnes 2020 center Andre Screen had 14 points and 11 boards. Wise (Md.) 2021 guard Daemon Ford had 13, Potomac School 2020 forward Jamel Melvin 12 and Good Counsel 2021 guard Daysjuan Waters 11. Maryland commit Marcus Dockery (Bishop O’Connell 2020) had 27 points for Team Level Up, which for 23 apiece from Flint Hill 2020 forward Dowar Jioklow and St. Mary’s Ryken 2021 guard Devin Ceasar, 17 from Patrick School (NJ) 2020 guard Anthony Thomas and 10 from Flint Hill 2020 forward Noel Brown.